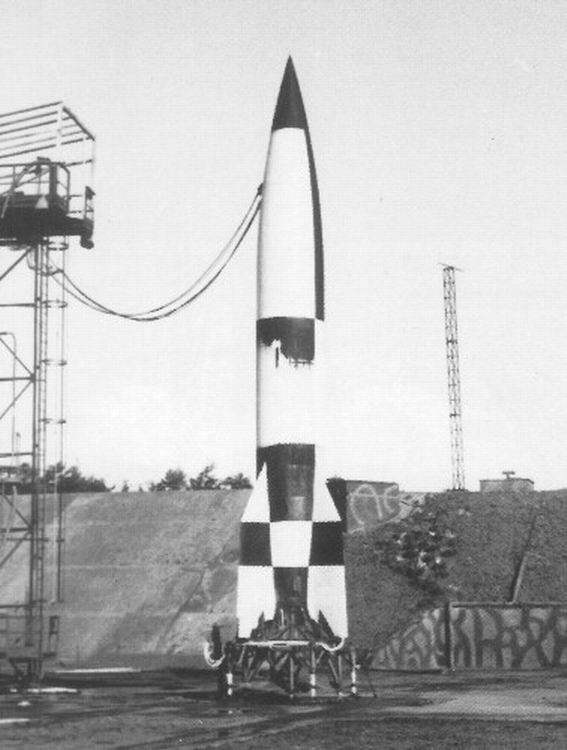 The V-2 was an unmanned, guided, ballistic missile. 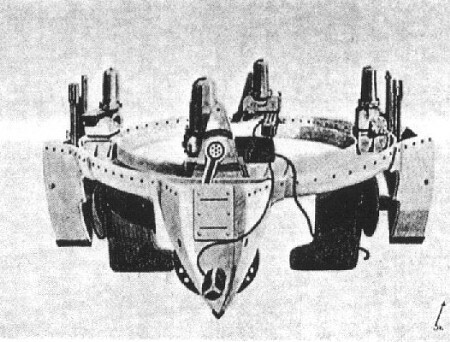 It was guided by an advanced gyroscopic system that sent signals to aerodynamic steering tabs on the fins and vanes in the exhaust. It was propelled by an alcohol (a mixture of 75% ethyl alcohol and 25% water), and liquid oxygen fuel. 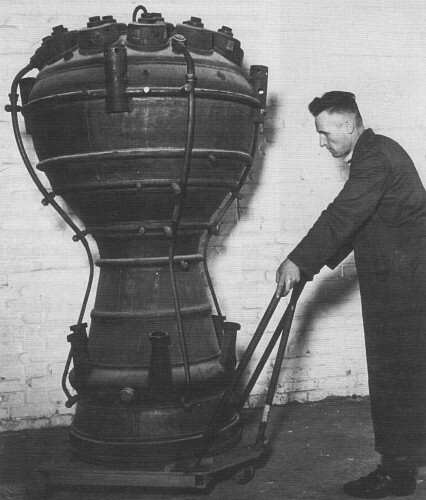 The two liquids were delivered to the thrust chamber by two rotary pumps, driven by a steam turbine. 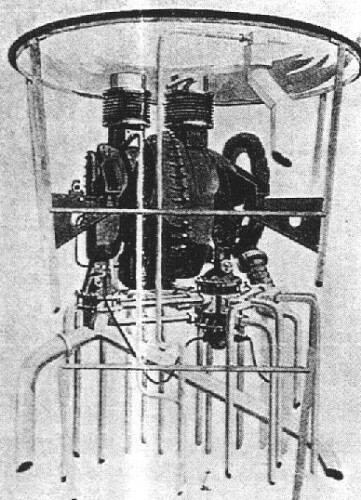 The steam turbine operated at 5,000 rpm on two auxiliary fuels, namely hydrogen peroxide (80 %) and a mixture of 66% sodium permanganate with water 33%. 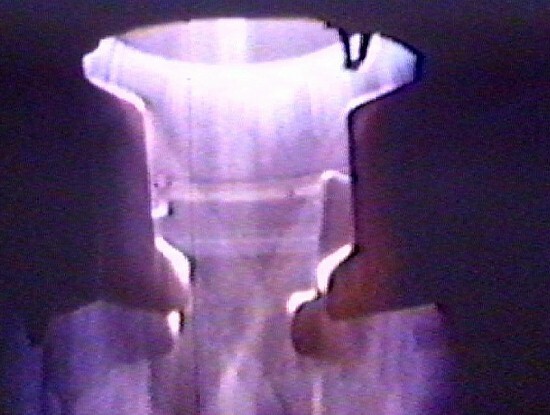 This system generated about 55,000 lbs (24,947 kg) of thrust at the start, which increased to 160,000 lbs (72,574 kg) when the maximum speed was reached. The motor typically burned for 60 seconds, pushing the rocket to around 4,400 ft/second (1,341 m/sec). It rose to an altitude of 52 to 60 miles (83 to 93 km) and had a range of 200 to 225 miles (321 to 362 km). 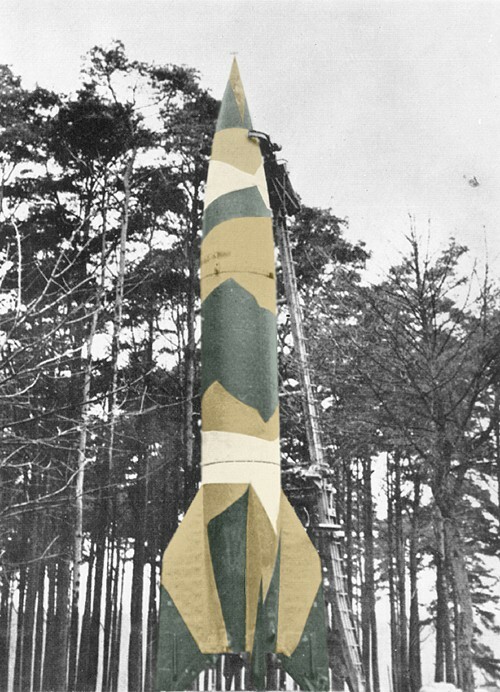 The V-2 carried an explosive warhead (amatol Fp60/40) weighing approximately 738 kg (1 ton) that was capable of flattening a city block. It was first fired operationally on Sept. 8, 1944 against Paris then London, this was the beginning of the V-2 campaign. 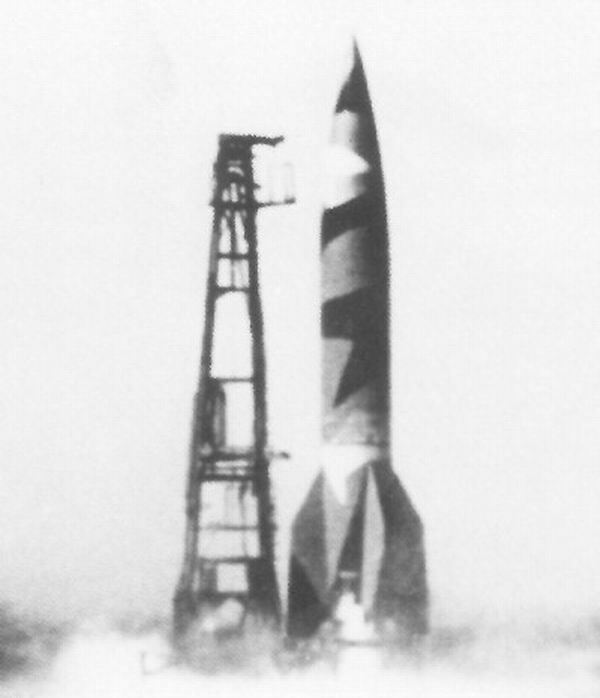 Before launch, the empty V-2 weighs 10,000 lbs (4,539 kg), it is filled with fuel, alcohol, liquid oxygen, hydrogen peroxide and sodium permanganate (catalyst). The air batteries and nitrogen batteries are filled up to 200 bar, and the rocket now weighs 28,000 lbs (12,700 kg). Electrical cables are now connected and gyroscopes are being powered up by 28 Volts / 60 Amps, DC. The cables are connected till launch, batteries take care of power supply during flight. After everything is set, pressurized air (32 bar) presses the hydrogen peroxide and sodium permanganate into the 580 HP turbine. This causes the turbine to rotate 3,800 per min. This turbine moves two pumps that inject the alcohol, at 23 bar via 1,224 nozzles (58 kg/sec) and liquid oxygen at 17.5 bar via 2,160 nozzles (72 kg/sec) into the burn chamber at 23 bar. The mixture is ignited, where a temperature of 2,500 degrees Celsius at 15 bar is reached, but is not producing enough impulse to lift the V-2. Soon after checking to make sure propulsion is working properly, the burning speed will be raised and cables are disconnected electromagnetically. 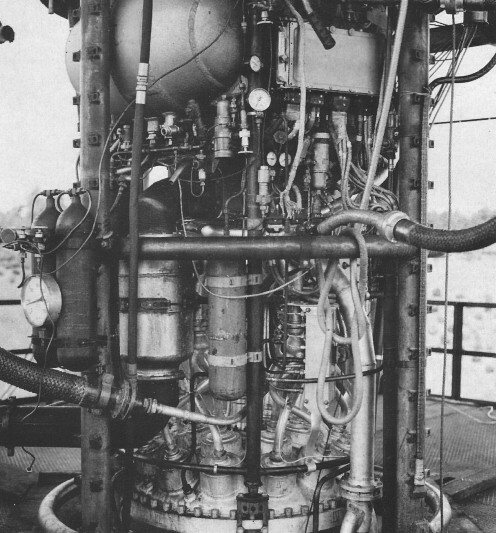 The V-2 engine burn chamber temperature was about 2,700 degrees Celsius. This wall is cooled by the liquid ethyl alcohol flowing via the double wall of the beam tube and burning chamber, which also heated up the ethyl alcohol. In the burning process, first oxygen is injected, without entering air, then spontaneous burn of the fuel and liquid oxygen, then gasses flow with great speed to the nozzle end. 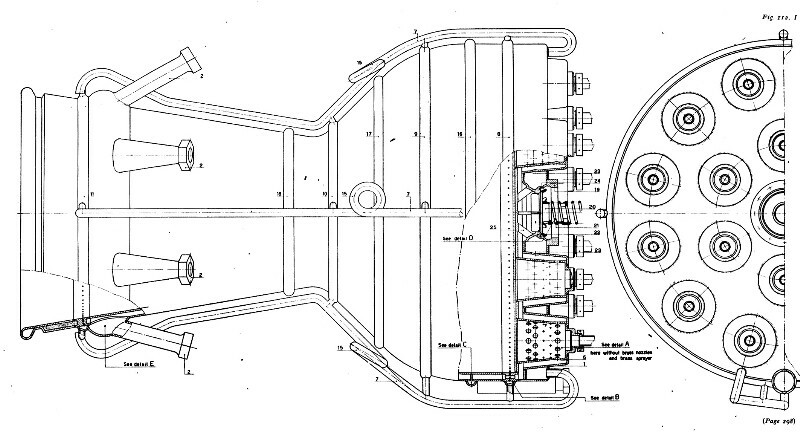 During burn time (about 60 sec) the V-2 is steered by 4 graphite rudders and 4 vanes (at the fins). To describe the steering process, one can imagine the mechanics of the vertical vanes and rudders 1 and 3, and the horizontal vanes and rudders 2 and 4, in this manner. - Vanes and rudders 1 and 3 (react together) control the oscillation and heading in the lateral movement, then the movement in the projectiles along a given axis, which stands perpendicular on the vertical movement by the same along the axis. Rudders 2 and 4 control the oscillation and heading in the vertical movement in the same manner on their axis. Vanes 2 and 4 controls roll stabilization. Vanes 1, 2, 3, and 4 are controlled by a gyroscope. They keep the axis of the V-2 vertical. 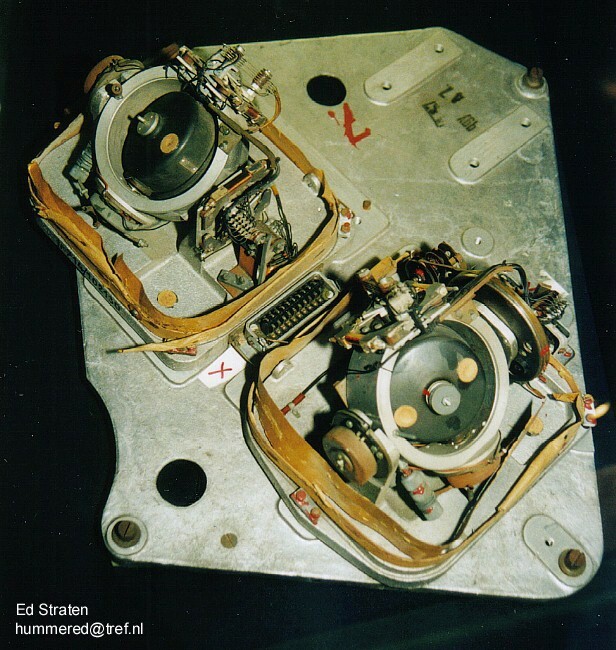 Rudders 2 and 4 are controlled by another gyroscope. They take care of the angle (as from the vertical) of the rocket during burn time. The latter gyroscope is controlled by a third gyroscope that makes sure the first mile will be straight up, after that it is turning until the correct elevation is reached, This elevation is kept until the speed is high enough to reach the target, finally the last gyroscope shuts off fuel supply. After shutdown the rocket acts as a regular artillery shell. Fully fueled, the V-2 had 4,900 kg A-Stoff which was liquid oxygen with a temperature of minus 183 degrees Celsius, and 3,710 kg of a mixture of 75% ethyl alcohol and 25% water, called B-Stoff. The oxygen evaporated so quickly that the tank truck started at the load station with 6400 kg, so when they arrived at the site for V-2 fueling, 1,500 kg was already evaporated. The rocket also carried 175 kg of T-Stoff, which was 80% hydrogen peroxide, and 22 kg Z-Stoff which was a mixture of 1/3 part sodium permanganate and 2/3 part water. 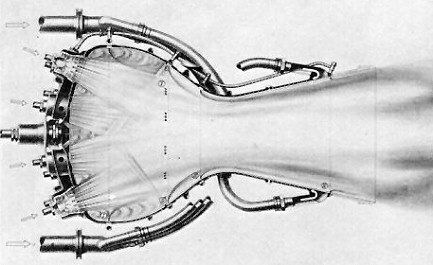 The latter was for propulsion of the 580 horsepower turbine, compressed air pushed those materials with a pressure of 32 bar in this turbine, 385 degrees Celsius vapor brought the turbine to 3,800 RPM. Each second, 58 kg alcohol of 23 bars had to be pressed via 1,224 injection ports, and 72 kg oxygen with a pressure of 17.5 bars via 2,160 injection ports into the burning chamber, that eventually at a pressure of 15 bars brought the temperature to 2,500 degrees Celsius. Initial lift pressure was 3 tons, which took 3 seconds (for observation of good ignition) and than raised to 25 tons. 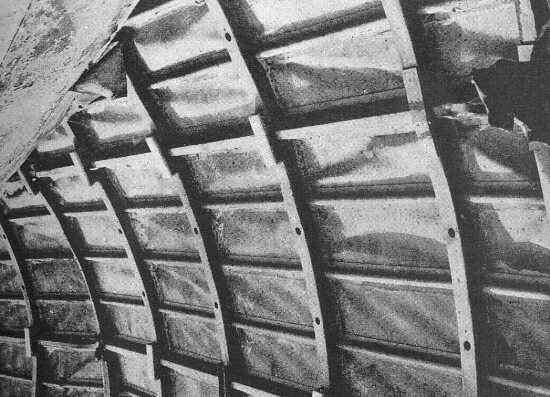 For the V-2 , 6,967 kg raw materials was needed (without the explosives and devices) of which 3,112 kg thin sheet metal (various thickness) e.g. the outer skin. Average price of a V-2 was 119,600 Reichsmark. 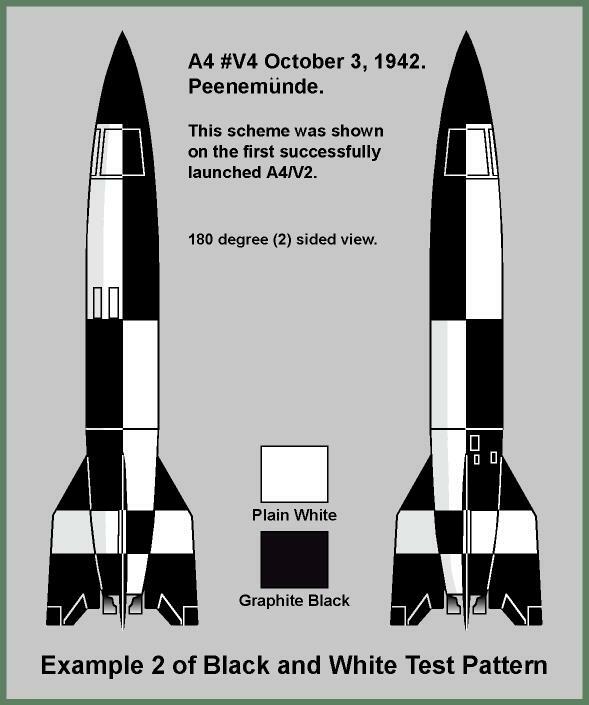 The A-4/V-2 rocket had an operational range of 234 miles. The max. burning time of the engine was 65-70 seconds, shortly before engine shutdown the A-4/V-2 weighed 4040 kg at a height of 35 km, starting with 1 G force, and at shutdown 8 G, after shutdown the rocket flew to a height of 97 km and fell to earth with a impact speed of 3,240-3,600 km per hour. Liftoff was straight up; 30 seconds after launch it reached speed of sound. When launched against targets close to the operational range of the vehicle, the deviation between target and impact was normally 4 to 11 miles (7-17 km away from target). This made the rocket only suitable for use against widely populated areas. At shorter targeting ranges, the accuracy of the A-4/V-2 was improved. 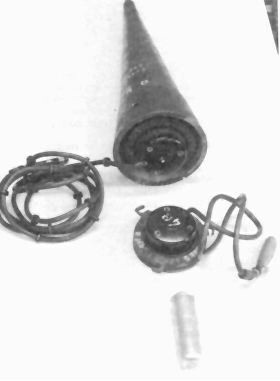 The Leitstrahlstellung was a “guiding beam” that improved accuracy of the A-4/V-2 somewhat during the later days of the campaign. 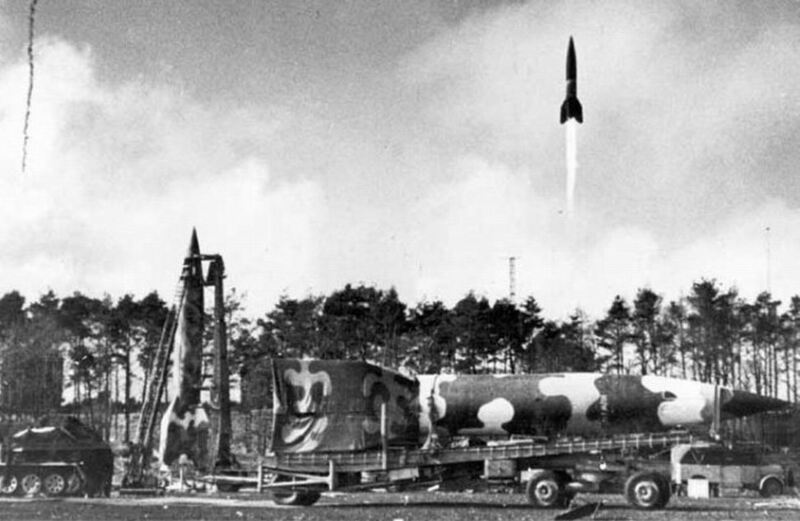 One quarter of all A-4/V-2 rockets were guided with the Leitstrahlstellung, only those launched by SS 500 Battery from Dalfsen/Hellendoorn area in Holland. A description of an A-4/V-2 impact would be as follows. First, a whip cracking sound of a blast wave created by the rocket (moving faster than the speed of sound) bounces off of the point of impact just split seconds before the flash of impact. This was followed by the chaos of the explosion with debris and earth churned skyward. Soon, the whine and rush of whistling air as the sound catches up with the rocket followed by a deafening roar of the incoming rocket, which tapers off to silence. There could be no warning. The A-4/V-2 impacted at 3 times the speed of sound. 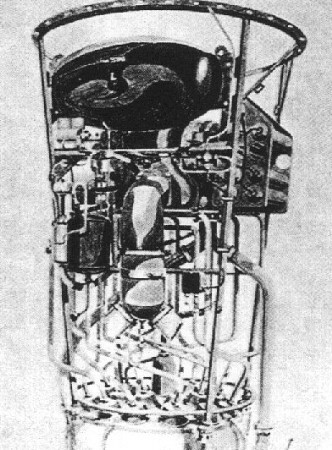 The V-2 offensive would last from September of 1944 until March of 1945. Close to 2,500 rockets were launched in this time period. The London area was hit by over 500 rockets and several hundred more dropped in surrounding counties. 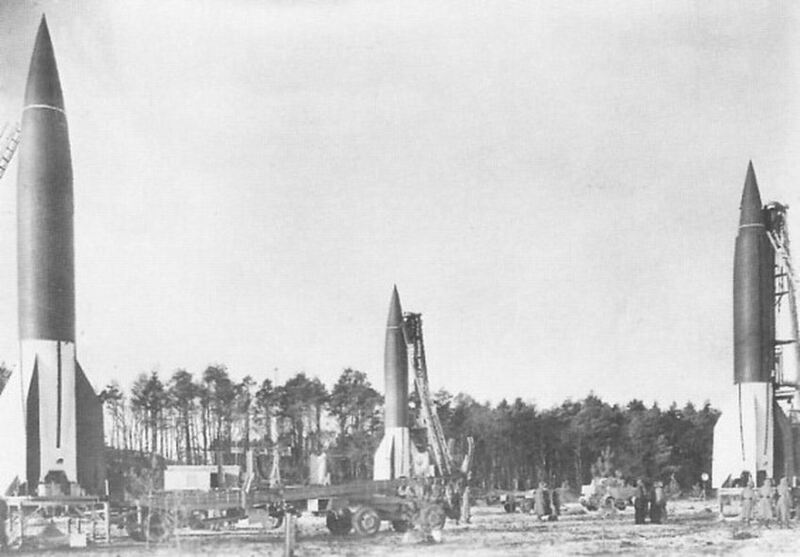 At first London and Antwerp were the primary targets, but rockets also fell around Ipswich and Norwich, and many Allied held targets in France, Belgium and Holland, and even on Germany itself. SCHEME 1 - The Gebatikt (Batiked) pattern, using 5 colors: Cream White, Earth Grey, Oxide Red, Olive Green and Chocolate Brown. This scheme was sprayed and was simular to many traditional camouflage patterns. SCHEME 2 - The Geflammt (Wavy) pattern, using only three colors: Cream White, Earth Grey and Olive Green. 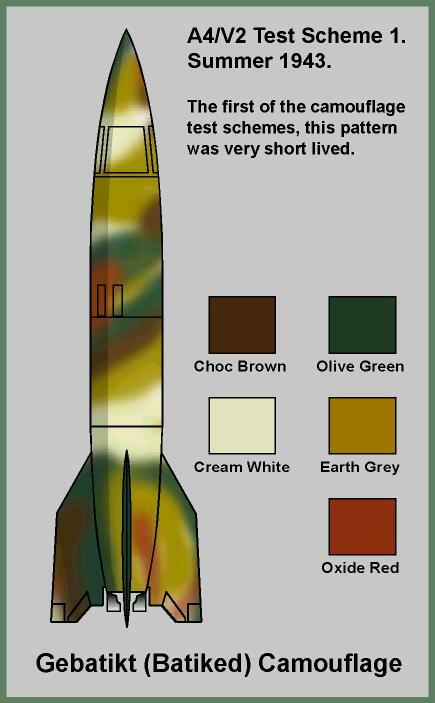 Later, during the waining months of the war, all A-4/V-2 rockets were painted a solid color of Olive Green only. Some Dutch eyewitnesses reported solid Cream White only rockets. The colors were the same colors used by the German Army throughout WWII. The eight RAL - Reichsausschuss für Lieferbedingungen (Government Committee for Specifications) colors were identified by number as; RAL 9001 Cream White, RAL 9003 Signal White, RAL 7028 Earth Gray, RAL 3039 Oxide Red, RAL 6003 Olive Green, RLM 71 Olive Green, RAL 8017 Chocolate Brown, RAL 9010 Clear White, and RAL 9011 Graphite Black. Note: RAL 9001 Cream White and RAL 9003 Signal White are not really 'white' at all. Army rockets did not carry the national aircraft or unit insignia. 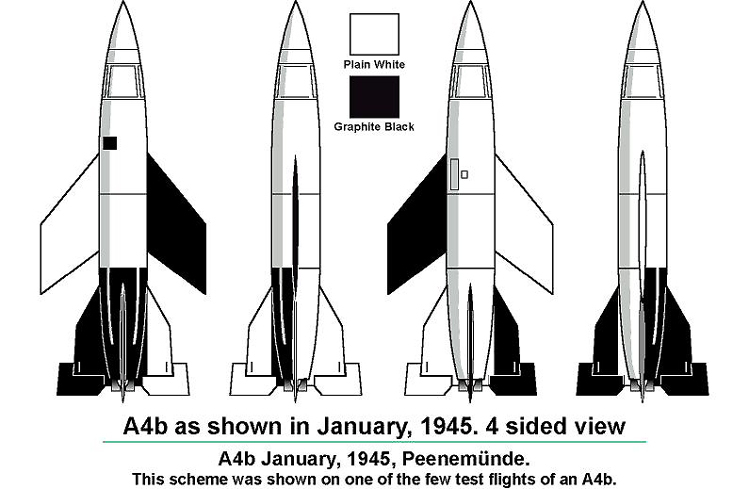 But, many of the Peenemünde test rockets did carry cartoon illustrations. 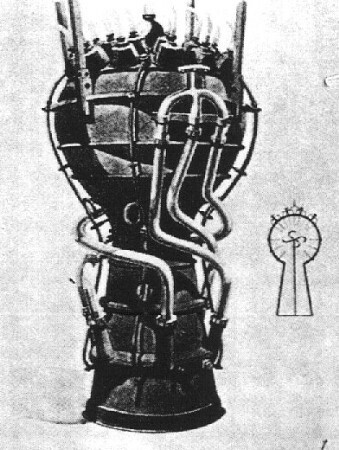 These illustrations were simular to WWII aircraft nose art in design and connotation. Undoubtedly, many operational A-4/V-2 rockets probably carried hand-scribbled messages directed in jest, toward their intended recipients. 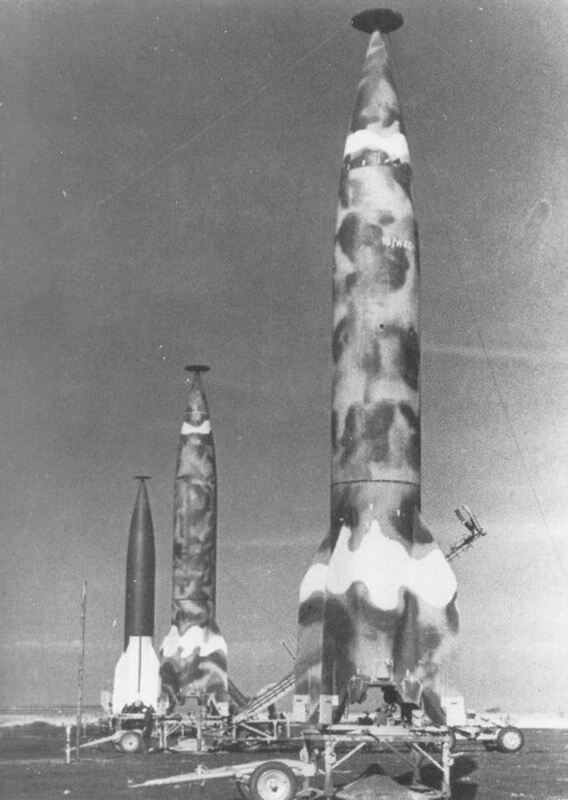 Many operational V-2s did have their army serial numbers painted on the body of the rocket near the upper section, as well as the lower section, adjacent to the fins. 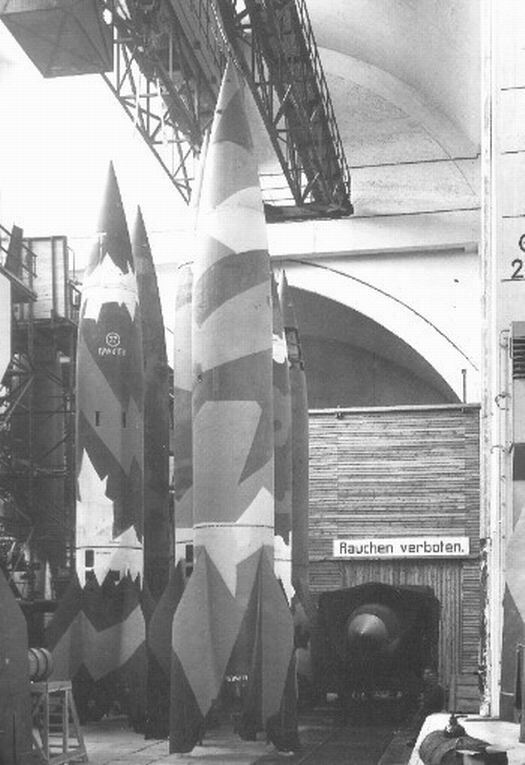 Source: Hölsken, Dieter: "V-Missiles of the Third Reich: The V-1 and V-2"